SAN FRANCISCO -- Air travel may soon get a little more uncomfortable. Zodiac Seats, the leading provider of airline seats, filed a patent last month that could completely change the way you travel in the sky. 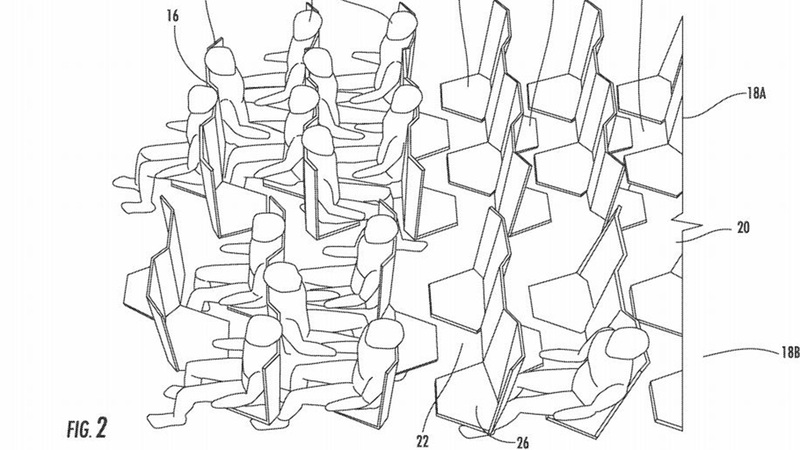 Instead of traditional rows of seats, the company designed a hexagon seating arrangement for aircraft cabins. The design would require passengers to sit in alternating front or rear facing seats. If you are facing the front of the plane, the people on either side of you would be rear-facing, and most likely staring at you for the duration of the flight. Now, leg room is at a premium, but the patent acknowledges that shoulder room might be hard to come by with the new design. "The seats are positioned at the same longitudinal position within the cabin, so that the space needed at shoulder and arm area is limiting on passenger comfort," the patent says. To read more about the design and to see other photos, click here.